Introduction: Laparoscopic Roux-en-Y gastric bypass (LRYGB) is an effective treatment for gastroesophageal reflux disease (GERD) in morbidly obese patients. However, LRYGB in patients with a previous anti-reflux procedure may present a significant technical challenge. We aimed to demonstrate the safety and efficacy of laparoscopic revision from anti-reflux procedures to LRYGB in a series of morbidly obese patients. Methods: Using a prospective database, we reviewed all patients who underwent laparoscopic revision of an anti-reflux procedure to Roux-en-Y gastric bypass from September 2004 to July 2008. Results: Five morbidly obese patients with a previous history of anti-reflux surgery undergoing LRYGB were identified and reviewed. Three of the prior anti-reflux operations were performed open and 2 were performed laparoscopically. The average time between operations was 11.2 years (range 6-14). The average preoperative BMI was 43.2 kg/m2 (range 35.8-50.8). All 5 patients were on antireflux medication preoperatively, and 4 (80%) were refractory to maximal medical therapy. All patients underwent LRYGB; 1 (20%) patient required a conversion to open gastric bypass due to dense adhesions. Mean operative time was 320 (range 235-482) minutes and mean blood loss was 310 cc (range 50-700). The mean length of stay was 4.5 (range 2-7) days. There were no perioperative complications or deaths. At a mean follow up of 16 (range 5-30) months, 80% of patients had complete resolution of reflux symptoms. The mean excess weight loss was 53.8% (range 32.7-77.4) and 13/22 (59%) co-morbid conditions improved or resolved. 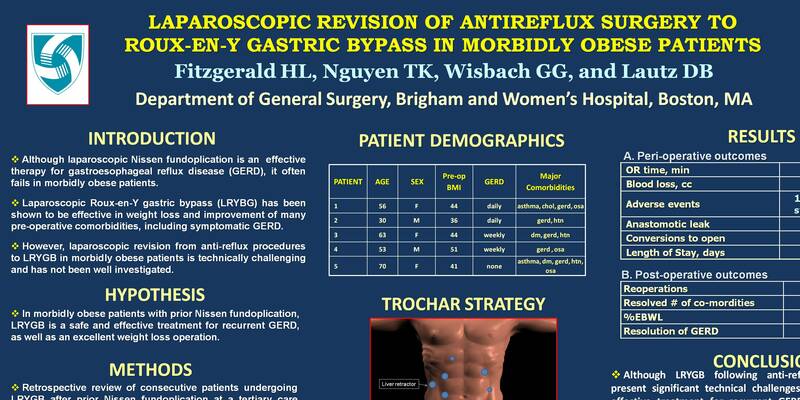 Conclusion: Although LRYGB following anti-reflux surgery may present significant technical challenges, in this series we demonstrated that it can be done safely, without significant morbidity, and a low rate of conversions. In addition to significant weight loss, LRYGB resulted in an effective treatment of recurrent GERD in our series of morbidly obese patients with failed anti-reflux surgery.